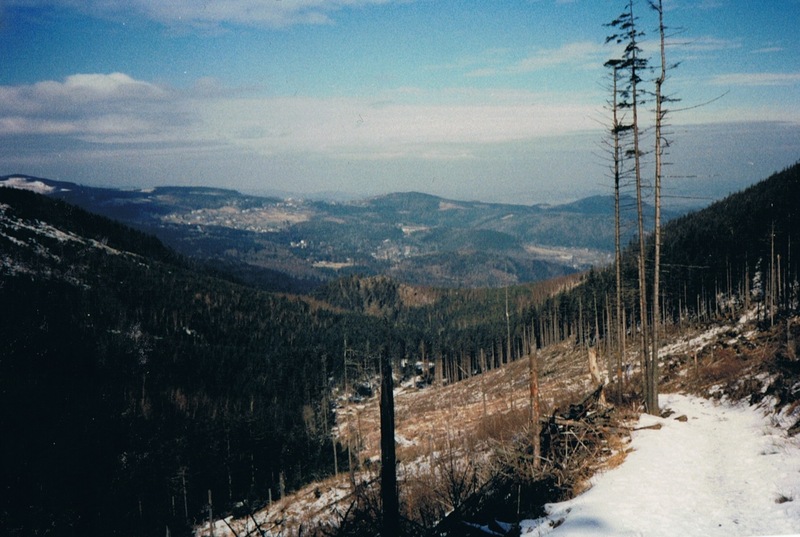 Getting there: the German highways to Dresden and Görlitz, in Poland to Jelenia Gora and you are in the Polish side of the Giant Mountains. Silesia. We started at Szklarska Poręba. Perhaps you also can fly to Wrocklaw (P). 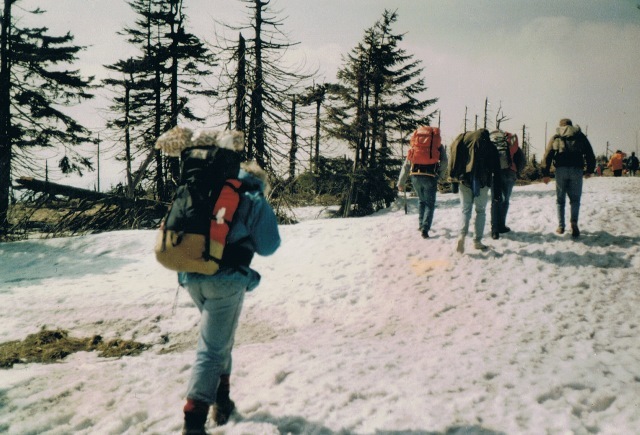 Maps: You can buy good and useful hiking maps almost everywhere in the area. On trail the marks can be disappeared, as we discovered, and so we sometimes got lost. 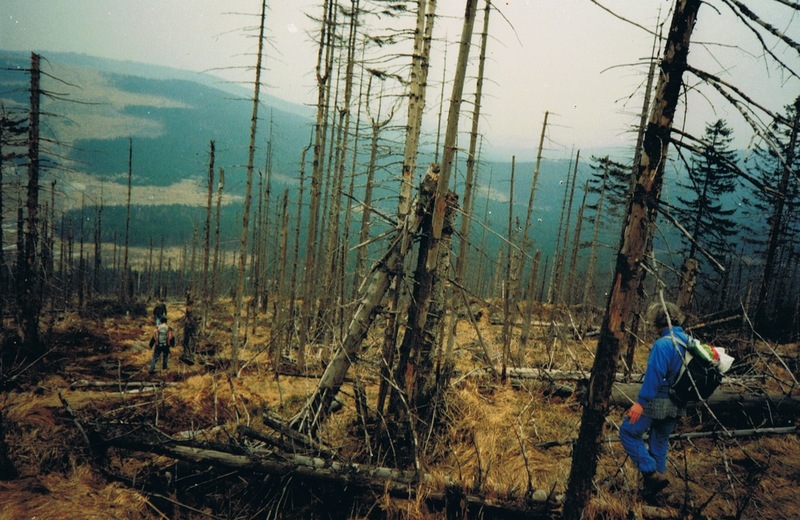 At height you can see the destructive influence from the unrestrained pollution (industrial emissions, heavy industry, cole) in the past: dead trees, no leaves.... (picture 5, 1991). Nevertheless there is a lot of great nature left and to discover. And Poland is working hard to recover the area. We used (map): Karkonoski PN, PPWK, 1991, scale 1:30.000. Meanwhile (2019) there are more maps. 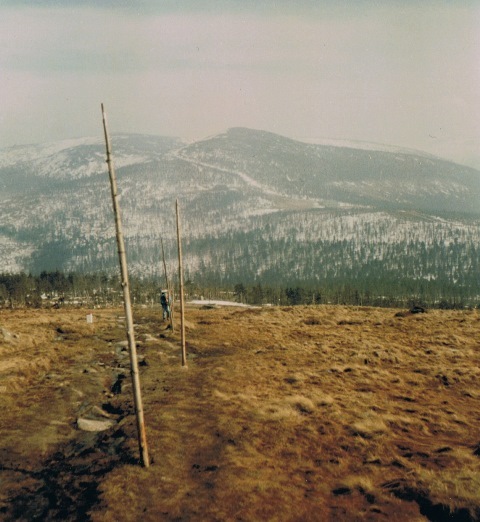 Such as: Geomat– Karkonosze, scale 1:40.000. Polish. Accommodation: finding a place to sleep and to eat was easy. Beside hotels there are a lot of private pensions and other kinds of private initiatives. Day 1: Szklarska Poręba - Karpacz....................................25,6 km. 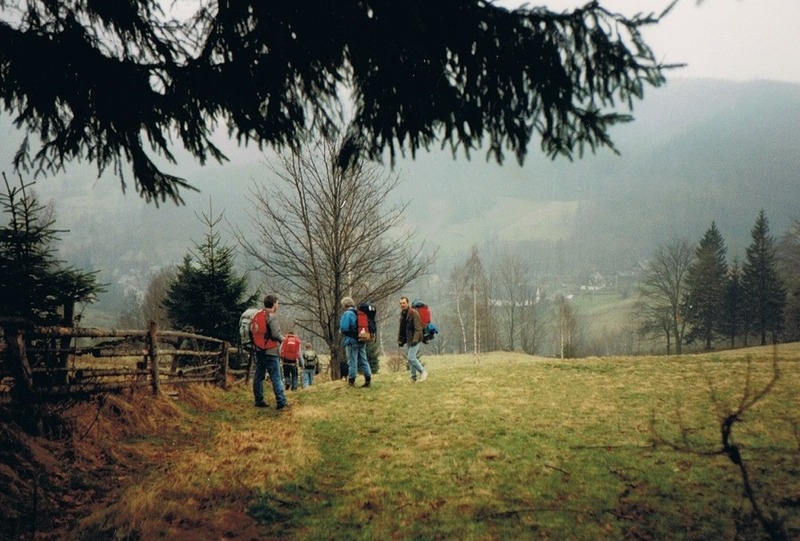 A handy tool for walking at home: a routemaker (Polish). 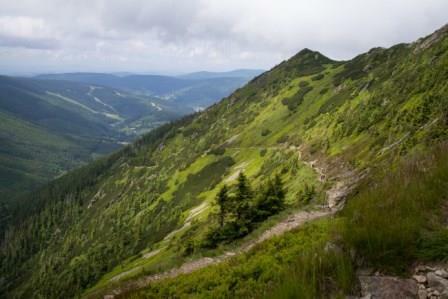 On trail: The Giant Mountains are a mountain range that forms the border between Poland and the Czech Republic. 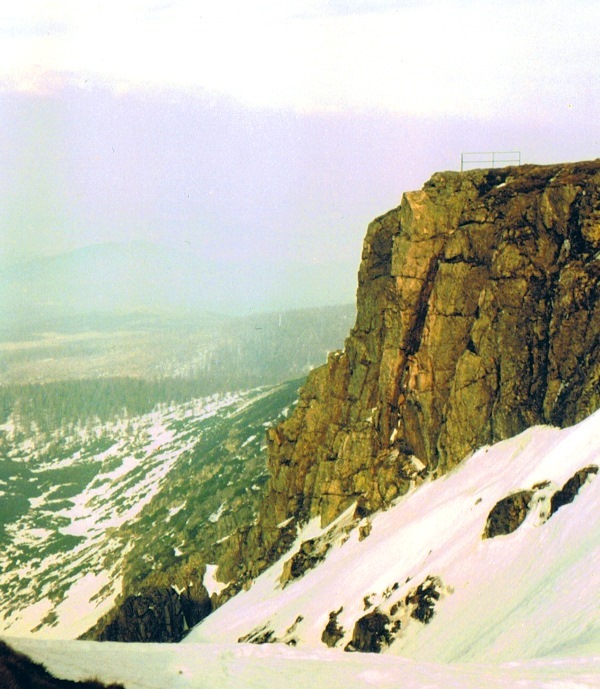 A large part of the mountains is a National Park, nowadays. Something that will undoubtedly help to restore the destroyed nature and restore the landscape. 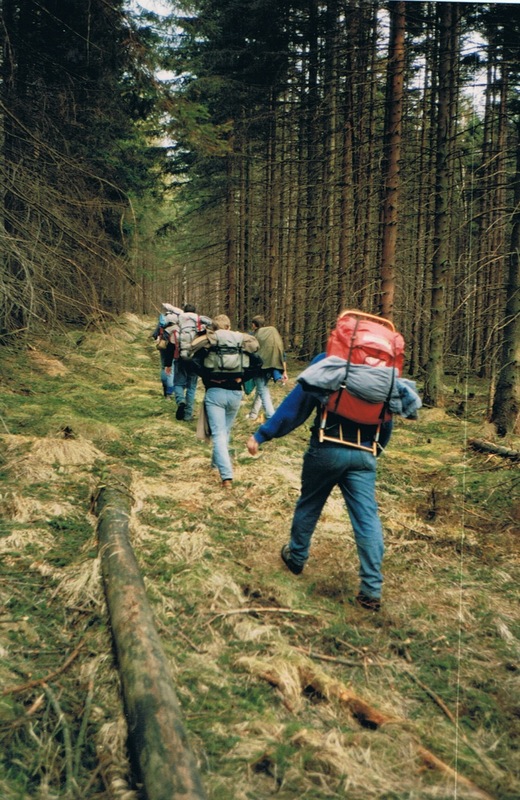 The area has many meandering streams - the Elbe rises here - forests and marshy areas. The old-slavic word Krkono means "bearer of the mountain pine", a tree species that is common in the higher parts of the mountain range. The mighty rock formations at altitude are impressive. 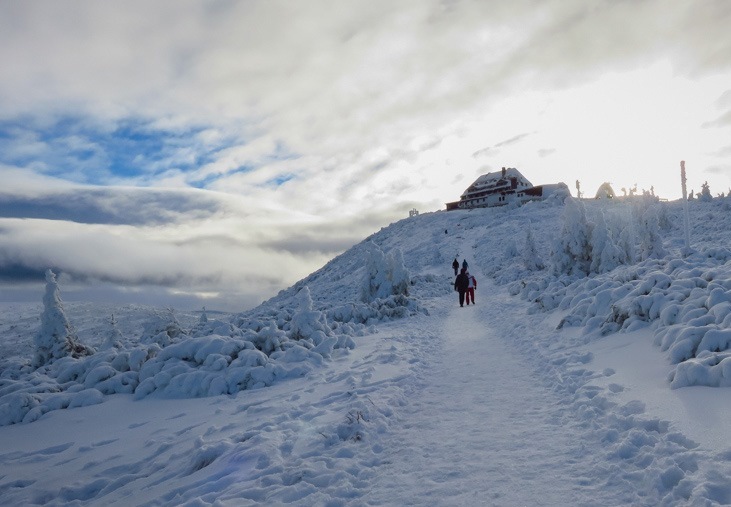 When we walked there deep into the snow, which makes the view even more impressive, to feel yourselve very small. If you come back later in the season, you look forward to the beauty of the area. At Szklarska Poreba you can visit beautiful waterfalls. Wodopad Poreba, 13 m or Wosospad Kamienczyka, 27 m. Follow the signs.